Mary also worked on her letter of the week using our new Dry Erase Center (thank to a Hobby Lobby coupon!). This is such a cool little way to do tracing, playdough letters, mazes, and lots of other fun things! No, it's not Mardi Gras, it's our new History Sentence Lapbook! I watched this great tutorial from Wisdom & Righteousness on how to make a tri-folder lapbook. Easy cheesy! Every week, I'm going to find a small picture or clip art that goes with that week's history sentence for Mary to color. Then, she'll glue it (with help, or they would all be stacked on top of each other!) into the lapbook. Quick, easy, and a fun way to review our history memory work! Above, you can see our memory board set-up. We also have our Letter of the Week pretties and AWANA crafts taped to the wall. We always leave the seats opposite the girls empty so they have an unobstructed view of the memory work. Poor things! 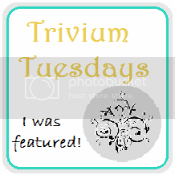 ;) If you want to make your own tri-fold board, check out Brandy's how-to. I copied hers, although I accidentally bought the wrong-sized board. Bummer. Now, to get to the title of this post, right. Map Friends have become a big deal at our house. Both girls absolutely LOVE them! We do a lot of pretend-play with them, moving them to this country or that ocean. Fun, fun, fun! However, I wanted to keep that excitement as we learn new places each week. So, I found a perfect map on C3 that has Weeks 1-2 Geography memory work on it, and I made our Mesopotamian Map Friends! 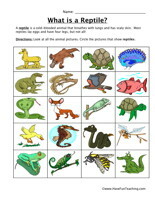 To find the map on C3, the file name is Geography Cycle 1.docx by user cherylfloyd. It's under Week 1 and Cycle 1 in Geography. And here's a little close-up of our new 'friends.' To find the images, I just googled Mesopotamian Clip Art and looked under Images. Then I printed and laminated them (can NOT live without both of those! 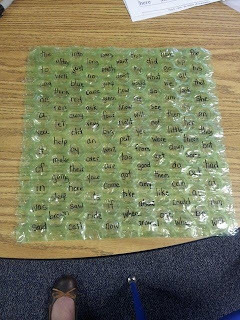 ), and then I attached the CLEAR Velcro dots. We have a Mesopotamian king, princess, warrior, and a smiling Pharaoah for fun. (Although Crete is not in our memory work this week or next, per my daughter's request, I made a Minotaur map friend. 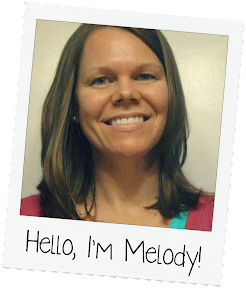 She LOVES mythology and has really latched on to the story of Theseus and the Minotaur. So, he's included in this picture, too, in case you were wondering who that monster was on the top left of the Med. Sea.) This has been a super-fun way for us to learn new places. 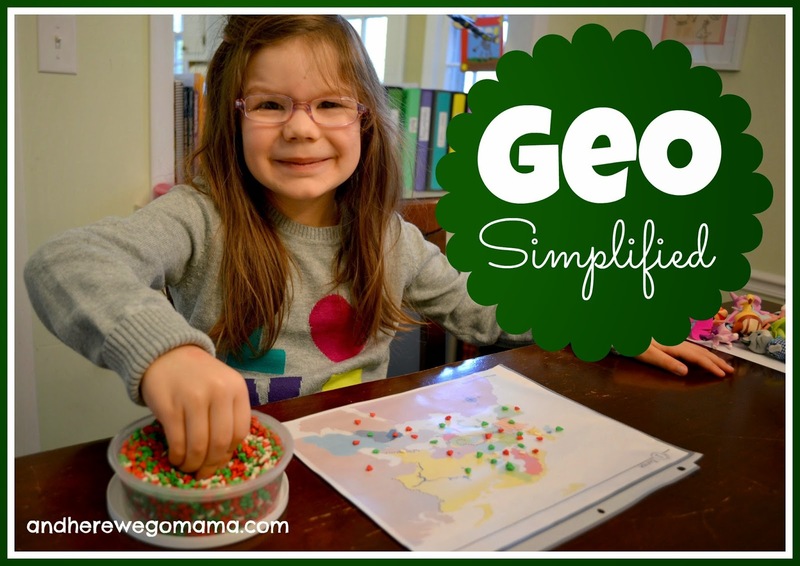 If you have little ones who are not too jazzed about Geography, you might want to give this a try! So far, Week 1, Day 1 is going pretty well, but I'm still trying to find our rhythm and balance. I've fallen behind in our LOTW stuff, and I still don't have all of my actual lesson plans written down for the week. But, as our CC director said yesterday at our opening assembly, FLEXIBILITY is the word for the day (or week, or month, or YEAR, as far as I'm concerned!). UPDATE: This map was such a success, I went ahead and put together a whole book of maps for all of Cycle 1. Check it out here! I have an art degree, and I love art, but I'm ashamed to say that yesterday was the FIRST time I've ever 'done art' with Mary. Terrible, I know. Having our own paints and other supplies now certainly inspired me to let Mary go at it, so that's what she did! She enjoyed mixing the colors and using different brushes and the roller. Even though we've never painted together before, I have attempted to expose the girls to famous paintings and artists in other ways, namely books. 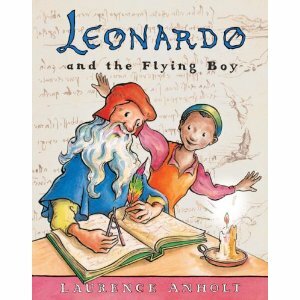 Any of Laurence Anholt's books are wonderful! 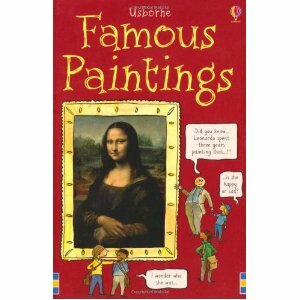 He has a whole series on famous artists; Degas and da Vinci are our favories! Oh, the 'Katie books!' 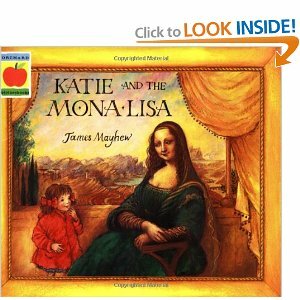 We LOVE these books by James Mayhew. 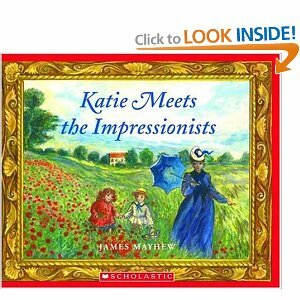 They introduce so many wonderful paintings in each book, and the story is cute (Katie roams around a museum and steps into the paintings having little adventures). 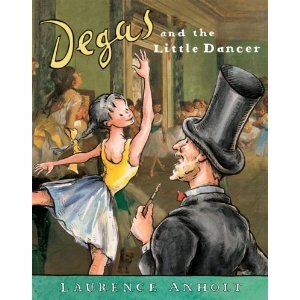 He's also written some great children's books about famous ballets that we enjoy as well. The cards above are what we use for Calendar Time. 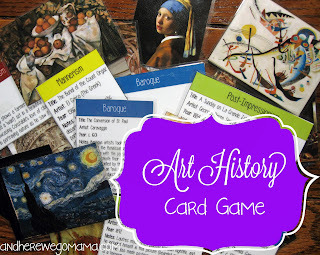 They have lots of information about the painting and artist on the back of each card. We love these, too! Our CC orientation went really well last Tuesday night! I am SO excited about this year, and our group looks really 'together' and organized, so that's definitely a plus! However, our director suggested that we bring our Foundations Guide to class each week for a while. I don't know about you, buy my purse is already stuffed with junk; how in the world am I supposed to put that big ol' book in it?! Well, not to worry... I have a plan! A friend mentioned to me the idea of a memory work flip chart a few weeks ago. Brilliant! So, I took a few hours, went through the Foundations Guide, and typed up the memory work into an MS Word document. I had originally planned to cut out the cards, laminate them, and get them bound at Staples (which is why there is extra room at the top of each card), but then I remembered that I had some small, old photo albums in the Craft box downstairs. I squeezed four weeks onto one page of cardstock, as you can see above. Then I cut them out and inserted them into this cheap little photo album. Ta-da! Now I can just throw this in my purse instead of carrying around that big book (and I really do love the 'big book,' but you know it can get heavy, and it's hard to flip through sometimes because it's so floppy.). And I can keep this in my purse when I go to the library, too, so I know exactly which books to look for that week that go along with our memory work! I uploaded the file to C3, but I've had so many problems with it printing correctly, that I just ended up taking it down. I made it in Word, and each time I opened it something new was wrong! I'd fix it, save it, close it, and then open it up again to check it - WRONG again! Sheesh! Anyway, sorry about that. The hubs says that Word is like that. Bummer. 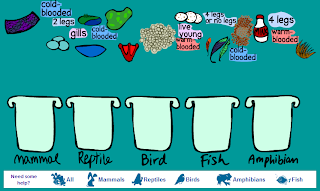 Well, it's really late, but I just had to quickly share this because I think it's so handy! It did take a while to type everything in, obviously, but I'm really glad that it worked out the way that it did. Time well spent (I hope!). We have finally finished Phase 1 of our downstairs school room! At the back of the room are the bookshelves that are just for me. This shelf holds our curriculum, binders, flashcards, and the CC Cycle 1 box. I plan to put some games in that empty space, but I just haven't done that yet. This is the other shelf that's only for me - the art supply shelf! We have lots of different kinds of paints, brushes, stamp pads, tons of glitter, and smocks. I'm not really all into crafts, but Mary is turning out to be pretty artsy, so we're going to run with it! As we work our way around the room, this is the wall opposite the one with the shelves for the girls. We have lots of educational stuff in the shelf on the right and books in bins on the left. You can also see our contruction paper, pom poms, and some other craft supplies and craft magazines on top. Phonics - Where is the Sound? Today I'm playing catch-up, as you can see above. I'm behind on Mary's Letter of the Week stuff, and I have some other things that need to be laminated. So, this is what my living room looks like when the unexpected happens. This time, the 'unexpected' was a day-care-closing-with-insane-rock-bottom-prices sale (thank you, God!). So now, our once-empty school room (not our dining room, but our real school room downstairs) is full of all sorts of art supplies, bins, bookshelves, and other schooly stuff. Cleaning, arranging, and organizing has kept me busy the last few days (pictures coming soon! ), which is how I got behind on Mary's LOTW work. But, things will come up. Life happens. And this has all been a good lesson for me on flexibility and going-with-the-flow (and if you've read this post, then you know this is not my forte). After Calendar Time, Mary asked to do a reading game. I saw this game in the amazing book Playful Learning by Mariah Bruehl, and I knew this would be good for my big girl (however, I had not put together the game yet, so I clicked on a movie for the girls to watch while I worked my magic. Yes, a movie on a Tuesday morning. I'm human, okay! ;) ). It's called Where is the Sound (p68), and it's super-easy to make. All I did was take a piece of cardstock paper and fold it up a bit. I cut out 3x5 pieces of construction paper (orange for consonants and yellow for vowels), laminated them (because almost everything made out of paper gets laminated in this house! ), and viola! If you want to make it even simpler, just use index cards. In other news, TONIGHT is our CC orientation! I. am. so. EXCITED! I really feel like this is such a big year for our little family. I can't wait to see what God has in store for us! 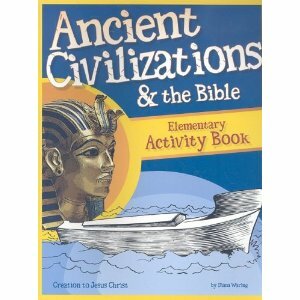 I'm using the Bible (obviously, right) and Ancient Civilizations & the Bible Elementary Activity Book by Diana Waring ($10 online). 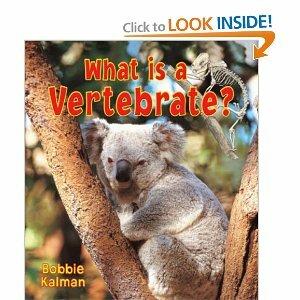 This book is recommended for grades K-4, and that's about right. My PreK girl won't be able to do much of the written activities, but the commentary is great, and it has some really neat ideas about crafts, songs, etc. I'll definitely use this more the next time Cycle 1 rolls around in two years, but I'm certainly glad I have it now, too. Okay, here's my plan: There are seven timeline cards introduced each week, so each day at the breakfast table I'll go over one 'special' timeline card in depth (but we'll still review them all after we go over the special card). Does that make sense? I also want to read a Bible story everyday right after breakfast, so I put together a daily Bible reading schedule that corresponds (as closely as possible) to that day's special timeline card. If I couldn't find a Bible story/passage that illustrates that day's card, I chose Scripture that relates to the History sentence or Geography work for that week. 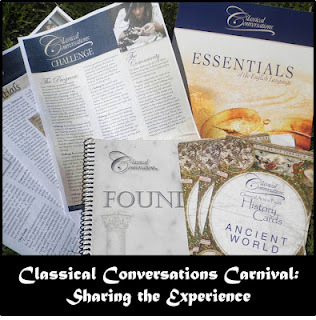 In the information below, TC is for Timeline Card and it's number on the back (these are the new ones, not the Veritas Press ones), and AC is for the Ancient Civilizations book (above) with its corresponding page number. For us, Day 1 for each week is Wednesday, the day following our weekly CC meeting. And here we go! Here is a really adorable pdf file of 'plague people' that I'll use when I'm reading this passage. It's from 1+1+1=1, which is an amazing site! UPDATE: Part 2 of our schedule is now available here. * I didn't start with Timeline Card 1, but I will read it the first day. I just decided to go into detail with TC2 because it was the beginning of time. 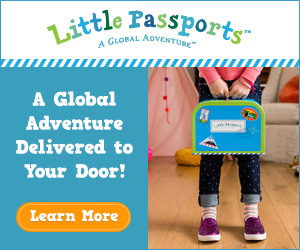 and Strawberry Shortcake and her friends are traveling through Europe, Africa, and the Middle East (Cherry Jam has a concert tonight in Rome)! I printed out the characters I wanted (Mary and Anna's favorites, of course), laminated them, and then attached little velcro dots (cut in half). This little project was so quick and easy! Here's how it looks when they're not in use. And here are the happy girls playing with their new 'map friends!' This has been a HUGE hit! This was an idea that just came to me out of the blue today. I wasn't sure if it would work out, but I'm so glad that it did! I think these little map characters will really spice up our Geography lessons! UPDATE: I made a smaller map for Weeks 1-2, and our Mesopotamian map friends are also now rock stars in our house. Check them out here! UPDATE #2: I went ahead and made a whole book of maps of each week's memory work. Now we can enjoy our 'friends' throughout all of Cycle 1! Click here to read about our new map book. 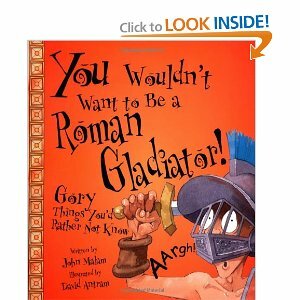 Week 6 - Ancient Rome, Part 2! Although the history sentence for this week is specifically about the fall of Rome (good stuff on the link above, btw), we'll probably just continue with most of what we did last week (see Cycle 1 - Week 5 post). * Read Acts 19:21 (Paul says he must go to Rome). * and Acts 27-28 (his shipwreck, getting bitten by a poisonous snake and being mistaken for a god, healing people on the island, and then his house-arrest in Rome). Here is a Sunday School lesson on Paul's shipwreck with some good ideas. Here is a pdf coloring page of the ship. Here is a coloring page of the shipwreck. And here is a coloring page of Paul's ministry in Rome (we like to color!). 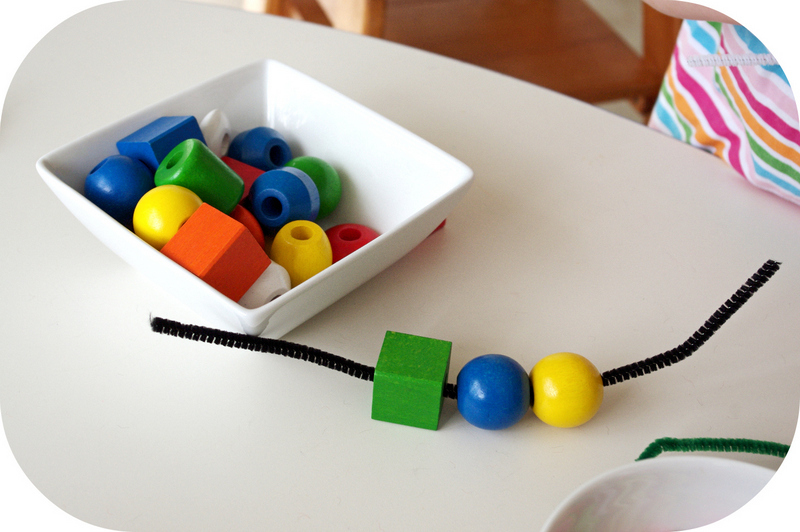 Here is another interesting preschool lesson plan pdf with some neat activities (making a paper chain and pretending to be Paul in chains, etc.). And here is an easy-to-grasp run-down of the story of Paul. * Paul talks about going to Spain in Romans 15:24, 28. * Keep coloring our maps and listening to our Geography Songs audios. * Listen to SOTW1: Chapters 41-42 (Fall of Rome), and listen to any of the other Rome chapters that we didn't get around to last week. I haven't read these yet, but we love this series. 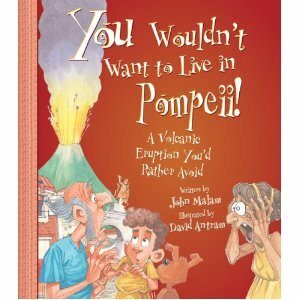 The reviews for the one above say that it has a lot of information about Roman culture in addition to Mount Vesuvius blowing its top in 79 AD and burying two Roman cities. It looks kind of gory, as the title says, but my sweet little girl pretends to cut off my head when we play Theseus and the Minotaur, so I don't think this will bother her. ;) (This kind of freaked me out at first, but maybe God is going to use her in the medical field or in some other area where she'll need to not mind icky things like blood and guts. At least I feel better about it when I tell myself that!) 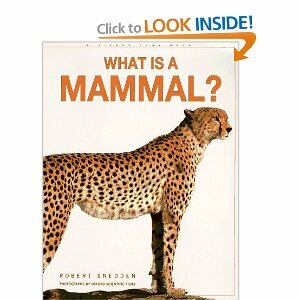 Click here for the FREE web version of the book. 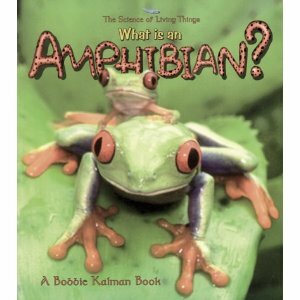 We'll also keep reading our books from last week. 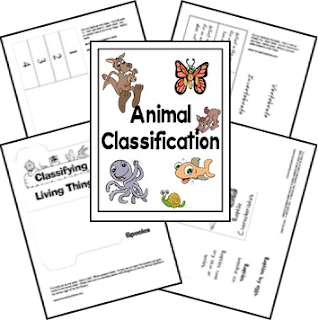 These are from File Folder Fun and are a super-cute and fun way to review the major groups of vertebrates. 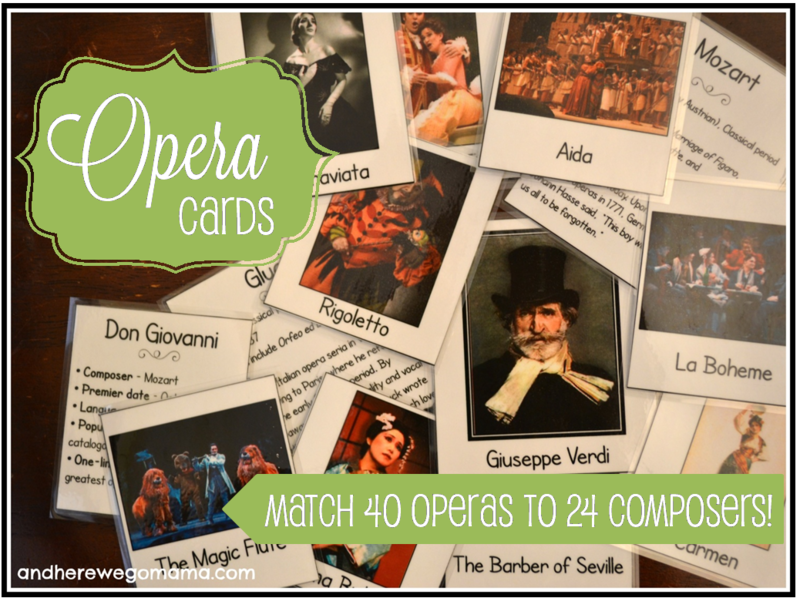 Click here and here to see my other quick posts on file folder games (we love 'em!). You drag the different characterics to the correct bin. It's short and sweet and you get a little surprise at the end! All of our English, Latin, Math, and Language Arts work will stay the same. 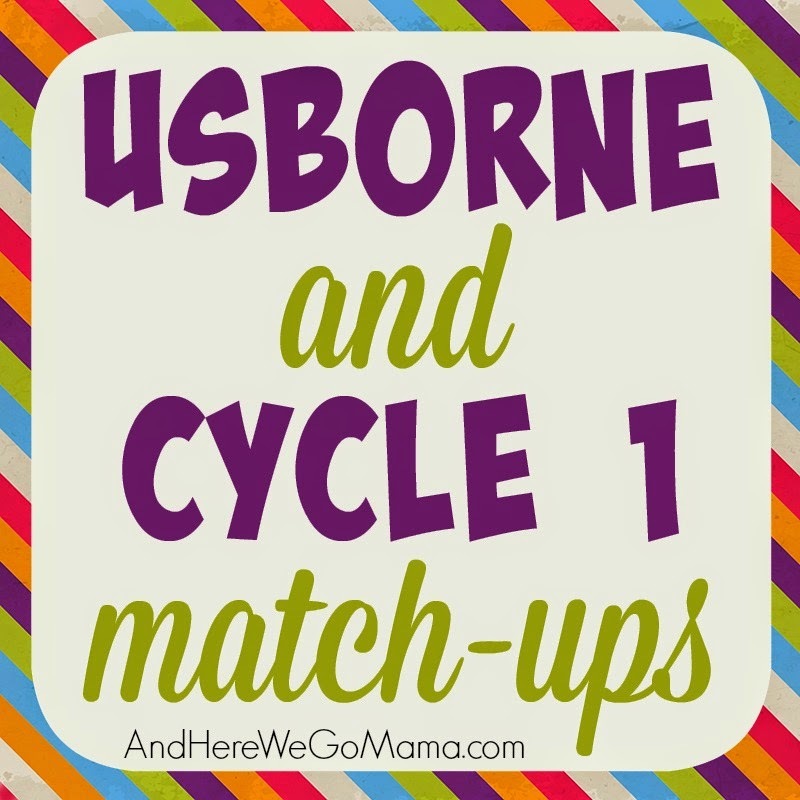 To see what those are, check out my Week 1 and Week 2 planning posts. If you're looking for ideas for previous weeks, check out my Week 3, Week 4, and Week 5 posts. 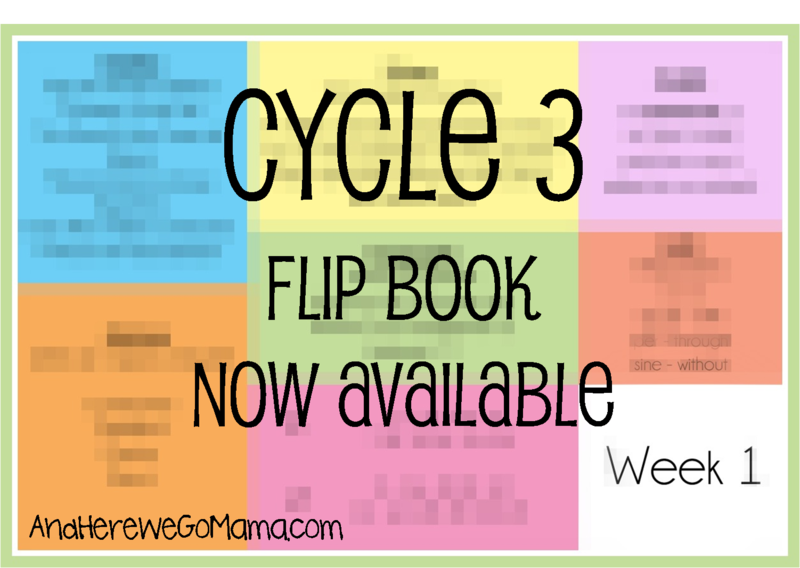 To see what other CC families have planned for Week 6, take a look at the Weekly Link-Up over at Half-a-Hundred Acre Wood. Happy planning, friend!